Mushrooms. I could seriously eat them every single day of the week. Their earthiness is something I find hard to resist, whether grilled, sauteed, or in this case, stuffed. 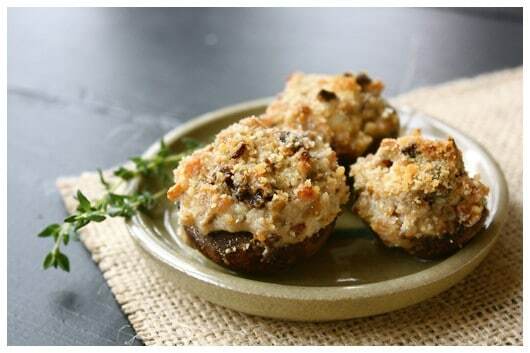 I remember making stuffed mushrooms as a kid, with a recipe of Mom’s that involved lots of gooey mozzarella cheese. It was a favorite appetizer that our family made for special occasions, and there were never any leftovers. 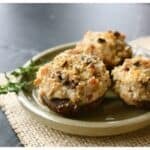 This recipe for Mushrooms Stuffed with Bacon, Blue Cheese, & Dried Cherry is a little more involved than the one from my childhood, but incredibly worth the extra time and effort. The meaty bites are packed with flavor. Lots of yummy flavor. I love how the salty bacon and blue cheese is offset by little pops of sweet dried cherry. It’s a fabulous coming together of tastes and textures. My “blue cheese is gross” oldest daughter even downed a few. There really is no resisting. And I have a GIVEAWAY to share with you from Ile de France! Ile de France sent me some of their beautiful Roquefort over the holidays. And I have proceeded to enjoy it sprinkled on green salads, on crackers with a drizzle of honey, and as a major component in the awesome Mushrooms Stuffed with Bacon, Blue Cheese, & Dried Cherry. Creamy and robust, this cheese is both versatile and delicious! And now, Ile de France is going to share some of their deliciousness with you. Together, we are giving away FIVE baskets of cheese! Each basket will include brie cheese, goat cheese, and Roquefort. **** This giveaway is now closed. Congratulations to Stephanie, Terry, Amanda, Merry, & Sylvie, who have each claimed their cheese basket. Thank you to EVERYONE who entered this giveaway! Simply leave a comment, sharing your favorite kind of cheese and your favorite way to eat it. Join a farmgirl’s dabbles on facebook. Leave a comment letting me know. Follow a farmgirl’s dabbles on twitter. Leave a comment letting me know. Share this giveaway on facebook and/or twitter and let me know with a separate comment for each way you shared. This giveaway will remain open until Thursday, January 12th, 6:00 pm CST. Five winners (USA residents only) will be chosen at random. I will email the winners, who will then have 48 hours to respond. If there is no response to claim a prize, another winner will be chosen. 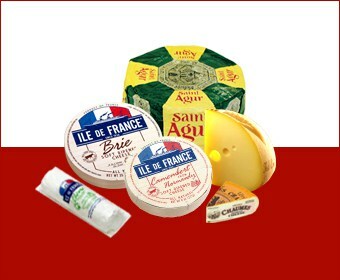 Disclosure: Thanks to Ile de France for providing me with yummy Roquefort to sample and the items for this giveaway. You can find Ile de France on facebook and twitter. All text and opinions are my own. Pop the stems off the mushrooms, then finely dice the stems. Set aside both the stems and the caps. In a skillet over medium heat, fry the bacon until crisp. Remove bacon to a paper towel-lined plate to cool. Add the diced mushroom stems and shallots to the same skillet with the bacon drippings, and give a stir every now and then. Once the shallots and mushrooms have softened (turn the heat down if they are browning too much), about 10 minutes or so, remove them to another paper towel-lined plate to cool. In a separate bowl, combine the cream cheese and blue cheese. Stir in the thyme, cherries, black pepper, and the cooled bacon, mushroom stems, and shallots. 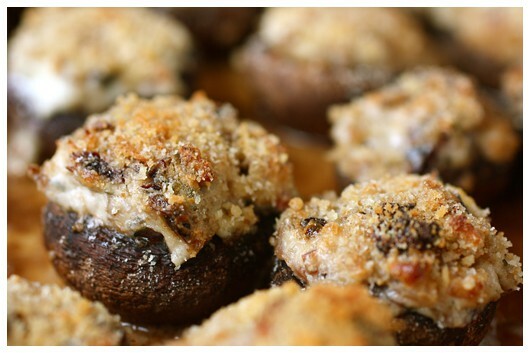 Using a teaspoon, fill the mushroom caps with a mound of the cheesy stuffing. Place in a baking dish and sprinkle with a bit of bread crumbs. Pop them into the oven and bake for 20 to 25 minutes, until softened and nicely browned. They are best eaten warm, so just let them cool for about 5 minutes before serving.